Kingborough Sports Centre, Level 4. Enroll today in a class that suits you best! If it’s your first lesson just need to wear something comfortable such as shorts/track pants and a t-shirt. Cost is $15 and students are welcome to bring along a drink. Learn in a fun, friendly and safe environment by both male and female professional and certified instructors. Instructors who have understand and have children of their own! Build your child’s confidence, control, coordination, social skills and respect for others with a touch of discipline. Cost for Term is based on $15 per lesson. Uniform $80 but doesn’t need to purchased straight away. $15 introductory lesson, which is deducted from the term payment if you decide to join. Pro-rata payment if you join part way through the term. Students are eligible for a new coloured sash during the last lesson of Term 2 and Term 4. Kung Fu uniform is required and this is a fantastic way to celebrate children’s achievement. This is considered a special time and their ‘hard work’ is celebrated. Our classes are specifically designed for children, and conducted by adults who understand children and who have children of their own. Whilst we have professional experience in this area we are also real people who care for children. Si-Fu Leigh is an ex-Tasmania Police officer, with in excess of 30 years in martial arts and 10 years teaching children. Please email us at taswingchun@hotmail.com or phone Leigh on 0429 107 108 to enrol your child in our Kung Fu 4 Kids classes. We look forward to seeing you soon. 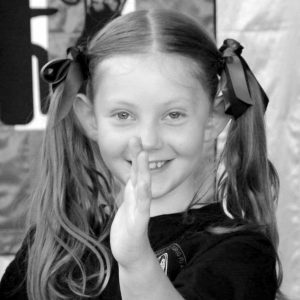 Wing Chun is perfect for children both male and female as it does not rely on size or strength. In fact Wing Chun is the ONLY martial art in existence which has been created by a woman. This makes Wing Chun ideal for children and perfect for self-defence against bigger attackers. We have specialised “Anti- Bully Programs” also. Whilst we don’t encourage violence, we also believe everyone has the right to be safe and have skills to protect themselves and others. Our Kung Fu 4 Kids, Kung Fu 4 Teens and Little Dragons Program are specifically designed with your child in mind and designed to give your child a healthy body and mind. Our idea is to help children to “Think the right thing” “Say the right thing” and “Do the right thing” in all parts of life. Our program promotes development in many areas including physical and mental development. We ensure that children understand the importance of their actions, to take responsibility, to think before acting and to work cooperatively within a group. Our Kung Fu 4 Kids & Kung Fu 4 Teens & Little Dragons Program offers many other benefits other martial arts simply cannot, due to the scientific structure of the Wing Chun System. We all want the best for our children, so don’t settle for second best……….give your kids the Wing Chun advantage. 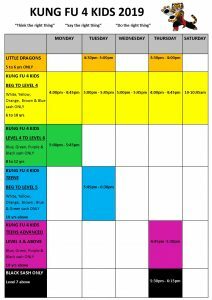 Come and try one of our Kung Fu 4 Kids Programs today! Come and see why we are Tasmania’s Premium Martial Arts Centre for children. Payments are on a per term basis NOT per lesson. What is Traditional Wing Chun? Traditional Wing Chun Kung Fu is a self defence system based on human movement. It is perfectly suited to children and people of smaller stature as it does not place emphasis on size, strength or athletic ability. It utilises two hands at the same time and is structured in such a way which is proven to work in self defence situations. It is easy to apply and fast to learn. Traditional Wing Chun will enhance your children’s physical coordination unlike other similar activities. The main focus is developing children’s confidence, control and coordination in a fun and safe “family based’ atmosphere. Stranger danger and danger awareness are also components of our Kung Fu 4 Kids Program. Our Motto is “Think the right thing, Say the right thing and Do the right thing. We aim to provide children with the skills to deal with problems in the right way, to have a health body, mind and spirit so that they can grow to be happy, healthy adults. 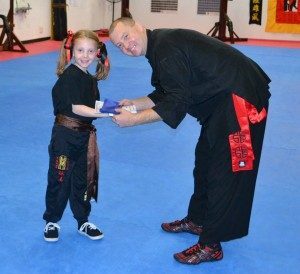 Will training in Traditional Wing Chun help my child be healthy and get fit? Yes, Traditional Wing Chun training is a whole body and conditioning exercise program utilising ancient Eastern training methodologies with Western sports science. It is a low to moderately intense program and with regular participation can assist in improving and maintaining a healthy body as well as improving aerobic and anaerobic fitness. Our program also improves thinking, reflexes, flexibility and strength which will assist with other sports and school activities. Is Traditional Wing Chun training suitable for all ages? Yes, our current program is tailor made to address teaching children from the age of 6 through to 12 years of age. Students practice and progress at their own pace. We also have separate teenage/adult classes from ages 8 and up. Will my child get hurt training in Traditional Wing Chun? No, our lessons are professionally supervised by qualified male and female Traditional Wing Chun instructors. While some of our activities require partner training, all activities are controlled and conducted in a supervised and safe environment. However, it is ‘martial art’ training and not ‘ballet’. We have less injuries then other sports such as soccer, football, netball and other physical activities. Our professional training areas are fully matted for your childs safety. What’s the difference between Traditional Wing Chun and other martial arts? Firstly, Traditional Wing Chun is the only martial art system not a style making it easier to apply in real self defence. It is one of the only systems to use scientific principles. Wing Chun Kung Fu utilises two hands at the same time unlike other similar activities which provides your child with greater coordination and reflexes. Our Kung Fu 4 Kids Program is designed for your children and for their developmental learning. How much does Traditional Wing Chun cost? Casual and term payments available with discounts available for two or more children. Lessons are conducted at the Kingborough Sports Centre and Launceston University Sports Centre during State Government School Terms. Annual membership fee is $30 per child. Parents can join in and help their children learn for FREE! Firstly, we would like you to contact us by phone or email to arrange your visit and introductory lesson at our training centre. From here, we will explain and answer any questions or concerns that you may have. On completion of the first lesson you then have the opportunity for your child to join the Kung Fu 4 Kids Program and commence their learning in Traditional Wing Chun Kung Fu.